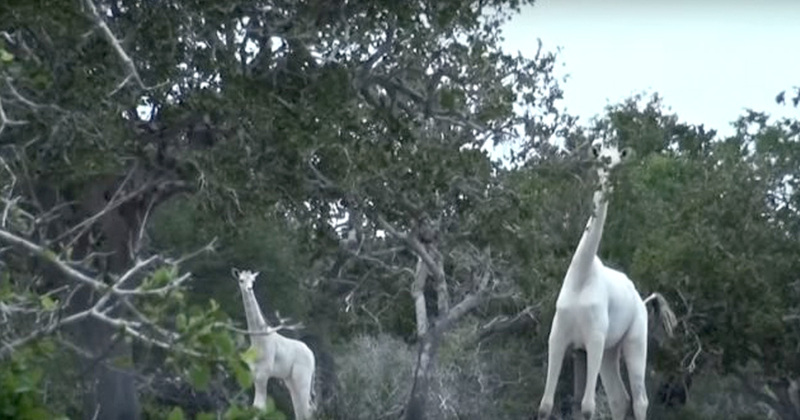 Residents and conservationists in Kenya were amazed when they spotted two rare white giraffes in Garissa county. The unique breed, which are mom and kid, were spotted at the Ishaqbini Hirola Conservancy. White giraffes suffer from leucism, a genetic condition that disrupts pigmentation in skin cells. Hirola Conservation Programme (HCP) manages Ishaqbini Hirola Conservancy. HPC is a non-profit organization committed to the preservation of the Hirola antelope, a rare and endangered species. "Unlike albinism, animals with leucism produce dark pigment in their soft tissue. This explains the white giraffes’ dark eyes and other coloring." The HCP was alerted to their presence early in June 2017 when local villagers informed rangers that they had located the white baby giraffe nearby. "They were so close and extremely calm and seemed not disturbed by our presence. The mother kept pacing back and forth a few yards in front of us while signaling the baby giraffe to hide behind the bushes – a characteristic of most wildlife mothers in the wild to prevent the predation of their young." "I could not, but help see the fading reticulates on their skin! It was evident that the coloration, especially on the mother giraffe, was not as conspicuous as the baby." Based on what was stated by the Hirola Conservation, the video is the third known sighting of the white giraffe, but the first time the animals have ever been caught on camera. They've been listed as ‘vulnerable’ by the International Union for Conservation of Nature, and there's estimated to be just 8,500 of their kind in the wild. This was the moment a golden retriever mix gave birth to four pups. However, those pups were not merely any old dogs (or young dogs for that matter). They looked exactly like cows. Katie and John Black have been fostering more 20 dogs short of a decade and were absolutely prepared to take on the responsibility of helping Rosie take care of her imminent family. What they really were not prepared for were cow babies. "Not quite what we were expecting. Our foster dog and Golden mix gave birth yesterday. To baby ‘cows.’"
In the photo, Rosie looks confused. A bit vacant, if not a touch thick. But hey, who am I to have a go at a new mom? Rosie, if you are reading this, it is all good. The four black and white spotted puppies are named Daisy, Betsy, Clarabelle, and Moo. Typical cows.